Why not get it right first time, our expertise comes not only from our fully qualified expert design and engineering knowledge, decades of design experience, but also an in depth experience of the water features installation and project management. Crucially we endeavour to understand you, our customer, in order to work together to achieve exactly what you want in order to create the perfect, high quality ambience for your aquascape. Yes that a lot for 5 points, but its a descent summary of what should be considered at design stage rather than during construction or after. For quality commercial water features we always recommend level control, uvc filtration, overflow/drain, cable entry armatures. With these items covered we can design and implement a vast array of water features. Book an appointment in our office with one of our qualified water feature designers and receive a free 30 minute design consultation on your ideal water feature. The service is ideal for small areas such as patios, raised beds and self contained water features but also extends to larger ponds, waterfalls and streams. When you meet our designer we will assess your requirements and provide a hand drawn sketch. We will advise you on different products and show you working examples. We will also provide you with a priced quotation, based on the information provided, for the products listed in the design. Call 045 870 970 now to book an appointment. Book an appointment with one of our qualified water feature designers and receive a 60 minute on site consultation on your water feature for an agreed fee starting from €200 Euro. This service is ideal for small areas such as patios, raised beds and self contained water features but also extends to cover fountains, ponds, streams & water falls. If you have an existing pond or water feature this is an ideal opportunity to receive qualified advice on how to maintain and improve your water feature. When you meet our designer on site we will measure your area, calculate water volumes and asses your requirements and draw out a concept sketch. Our designer will then take away the drawing to make any amendments and to finalise your plan. Within 10 days you will receive by post a hand drawn plan,design specification , material list and a priced estimate of costs. Book an appointment with one of our qualified water feature designers and receive a consultation at your home for an agreed fee starting from €600 Euro. This service is suitable for large projects that require design on more than one area of your scheme. When you meet our designer on site we will measure your areas, calculate water volumes and asses your requirements and draw out a concept sketch. Our designer will then take away the drawing to make any amendments and to finalise your plan. Within 10 days you will receive by post a hand drawn or CAD plan, specification, material list and a priced estimate. We can also consulate with your building team to ensure project is completed to specification, on time and to budget for agreed project management fee from €1200 for typical small project. 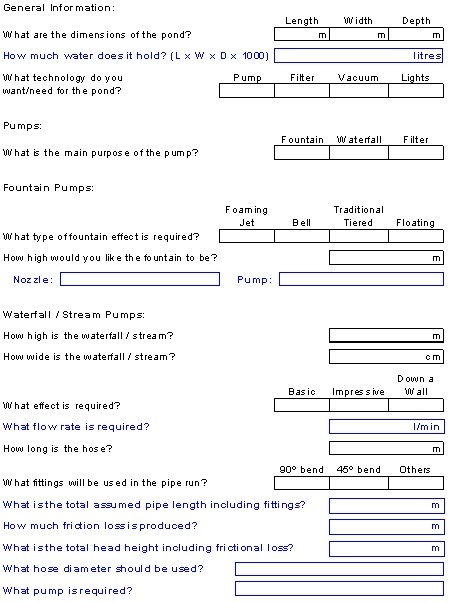 Typical technical questionnaire below or click here to some of our installations.